Abstract. In the last few years, the scientific community has witnessed an ongoing trend of using ideas developed in the study of complex networks to analyze climate dynamics. This powerful combination, usually called climate networks, can be used to uncover non-trivial patterns of weather changes throughout the years. 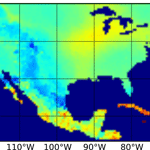 Here we investigate the temperature network of the North American region and show that two network characteristics, namely degree and clustering, have marked differences between the eastern and western regions. We show that such differences are a reflection of the presence of a large network community on the western side of the continent. Moreover, we provide evidence that this large community is a consequence of the peculiar characteristics of the western relief of North America. How to cite: Peron, T. K. D., Comin, C. H., Amancio, D. R., da F. Costa, L., Rodrigues, F. A., and Kurths, J.: Correlations between climate network and relief data, Nonlin. Processes Geophys., 21, 1127-1132, https://doi.org/10.5194/npg-21-1127-2014, 2014.